Julia Jacobs is fat. That’s the first thing Annabel notices when she’s assigned as Julia’s mystical ghostly helper (don’t call her a guardian angel), and it doesn’t bode well. Annabel might be minus her body these days but she still appreciates the discipline and control that leads to being thin – while Julia seems more interested in the school newspaper, what’s going on in politics, and what she’s going to do in college. As newspaper-related tensions with her friends increase, Julia’s tempted to let Gavin get closer, even with a voice in her head confirming all the ugly thoughts she’s ever had about herself. And as the connection between them strengthens, Annabel realises that there’s something Julia won’t let herself think about, something that she’s never told anyone. That maybe this is not about weight but about secrets – and that Annabel’s view of the world might be completely off-kilter after all. 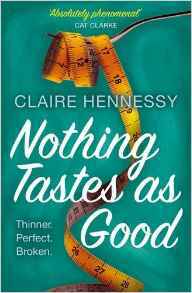 Eleanor and Park meets The Lovely Bones with a bite, Nothing Tastes as Good is a sharp and pacy novel for YA readers.